Have you heard? Riverbed has an awesome conference coming up. It’s called Riverbed FORCE. And you need to be there. 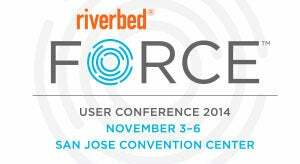 Riverbed FORCE is Riverbed’s user conference, being held November 3rd – November 6th, 2014 at the San Jose Convention Center in San Jose, CA. Riverbed FORCE is a unique user conference, equipping Riverbed customers with the tools and knowledge to make today’s hybrid enterprise perform at its peak. Supporting the hybrind enterprise is becoming more and more challengeing as users, applications, and data are everywhere. The general sessions will include thought-provoking keynotes from industry leaders such as Geoffrey Moore (author of Crossing the Chasm), Riverbed Chief Scientist Hansang Bae and CEO and Chairman Jerry M. Kennelly, and Intel CIO Kim Stevenson. There are also 22 other featured industry experts, including Joe Skorupa of Gartner and Andre Kindness of Forrester, who will be sharing their expertise throughout the conference. At Riverbed FORCE, we are offering over $1,875 worth of Riverbed Certifications– FREE. Being Riverbed-certified lets individuals and organizations know that when it comes to WAN optimization, network and application performance management, application delivery, storage delivery, and application acceleration, you mean business! Ten certifications are being offered at FORCE, as a Riverbed Certified Solutions Associate (RCSA) – primarily for entry-level engineers and IT support managers – and Riverbed Certified Solutions Professional (RCSP) – primarily for professional and expert level engineers and IT directors. RCSA and RCSP certification testing will be offered in WAN optimization, network performance management, application delivery, application performance management, and storage delivery. At FORCE, you will learn practical steps to make your hybrid enterprise perform at its peak in more than 60 technical sessions providing in depth training on optimizing key areas of hybrid architectures. Sessions will be grouped in four tracks – Cloud, Virtualization, Unified Communications and Collaboration and Networking. The sessions will be led by Riverbed product and technical experts, leading industry analysts, FORTUNE 500 and global customers, and technology partners, and span Riverbed’s product portfolio and platform. This is going to be awesome. And we want YOU there! We think it’s so important that you attend that we even wrote a letter for you to send to your manager highlighting just why they should send you. Join more than 1,000 customers, technology partners, and industry and Riverbed technology experts at this premier event. Learn more and register today.